Within a short walk of the popular Sandygate Mill pub, this detached house enjoys a pleasant position on a sought after road and is an ideal family home. The accommodation comprises of a lounge, conservatory, separate dining room and a stunning kitchen breakfast room with integrated appliances and granite worktops on the ground floor, whilst the first floor offers four double bedrooms and a family bathroom. There is also a useful office area. Lovely far reaching views can be enjoyed over the surrounding countryside. With driveway parking for approximately three cars, there is also a single detached garage and a further area of gravel, ideal for a work van, boat or camper. The gardens are a real delight and ideal for family life with an area of patio for alfresco dining, level lawn, bike store and rear patio. 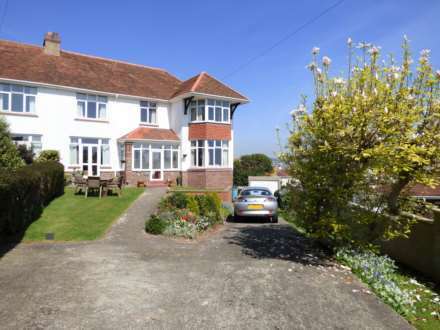 Kingsteignton offers excellent transport links to Exeter, Plymouth and Torbay and there is a mainline train station in the nearby town of Newton Abbot offering excellent connections to the capital. There are a wide range of local amenities, shops and both primary and secondary schooling along with the popular outdoor swimming pool a short distance away. For the outdoor lovers, Dartmoor National Park and the beautiful coastline of South Devon are within easy striking distance as is to the estuary towns of Teignmouth and Shaldon offering a plentiful selection of water sport activities and lovely beaches. Coved and textured ceiling with sensor light. Obscure double glazed window to the front. Low level flush WC, wash hand basin with tiled surround, space for hanging coats, radiator and wood effect laminate flooring. A stunning L` shaped room (maximum measurements used) with recessed spotlighting, two double glazed windows to the side aspect, double glazed window to the other side aspect and obscure double glazed door to the rear patio. The kitchen comprises of a range of matching base and eye level units with `magic green` polished granite worktops with matching upstands. Under counter lighting and kick board lights. Underslung sink unit with mixer tap and grooved drainer. Inset five ring gas hob with double canopy above and oven below with glass splashback. Integrated dishwasher and washing machine. Space and plumbing for American style fridge freezer. Storage cupboard, television aerial point, radiator and tiled floor. Currently used as a snug/play room. Coved and textured ceiling, double glazed box window to the front aspect with built in storage unit. Television aerial point and radiator. Triple aspect, double glazed windows over looking the garden and surrounding countryside. Double doors opening out into the garden. Wood effect laminate flooring and power points. Stairs lead up to a useful office area with sloped roof and two velux windows to the rear aspect. Telephone point. Coved and textured ceiling, double glazed window to the side aspect enjoying far reaching views over the surrounding countryside. Recessed area with wardrobe (formally an ensuite). Radiator. Coved and textured ceiling, double glazed window to the side aspect. Radiator. Coved and textured ceiling, double glazed box window to the rear aspect. Radiator. Coved and textured ceiling, double glazed feature window to the side aspect. Radiator. Textured ceiling with recessed spotlights, obscure double glazed window to the front aspect. Low level flush WC, pedestal wash hand basin with mixer tap above, bath with mixer tap and shower attachment above with glass block light feature, tiled shower cubicle with extractor light above, chrome effect heated towel rail, tiled walls and floor. To the front of house there is a driveway providing parking for approximately three cars leading to the detached single garage with up and over metal door. Eaves storage, power and sensor lighting and courtesy door to the garden. The remainder of the front and side garden is laid to level lawn with specimen planting and an area of gravel providing additional parking for caravan, boat, work van etc. Gated access to the rear patio with bin storage area and door to kitchen. Gated access to the garden via the front. The rear garden enjoys a level patio at the back of the conservatory, ideal for alfresco dining. The remainder of the garden is predominately laid to lawn with mature planting and seasonal climbers and fenced surround. Bike store to the side of the garage, small tool shed and raised pond. Outside lighting and water tap.